The Bilderberg group was formed in 1954 by powerful international banking families like the Rockefellers and Rothschilds, along with the heads of royal families throughout Europe, members of the elite, and the heads of the world’s most powerful multinational corporations. The secret agenda behind Bilderberg was the creation of the European Union, NATO, and a one-world government, economic system and religion. Several years before the creation of the Bilderberg group in 1946, President Donald John Trump was born in Queens, New York City. Today, Trump’s plan is to “Make America Great Again,” renegotiate trade treaties that build up the American working and middle class, reestablish our national borders with a fair immigration policy, welcome and protect Christians via national and domestic policies, and enforce the U.S. Constitution and Bill of Rights. In many respects, Trump’s goals are the opposite of the Bilderberg group and the globalists, and that’s why they see him as the single greatest threat to their technocratic-feudal system. In our bestselling FaithWords/Hachette book, Trumpocalypse: The End-Times President, a Battle Against the Globalist Elite, and the Countdown to Armageddon, written by Pulitzer Prize-nominated investigative journalist and former Los Angeles Daily News reporter Troy Anderson and I, we explore why the elite view Trump as their greatest threat and reveal the driving secret behind Trump’s life that caused him not to sell out like so many other billionaires and members of the elite so that he could as president seek to “Make America Great Again” — not just as a marketing slogan, but from his heart. The Bilderberg 2018 “post-truth” discussion is going to center around how the globalist elite through the Bilderberg conference, the Council on Foreign Relations and the Trilateral Commission will use science, technology and propaganda to destroy what they call “fake news,” which in most cases means the true news, or alternative media, that communicates the truth and facts based on evidence. The mainstream media is controlled by just a handful of globalist corporations and created the propaganda term “fake news” to silence the alternative media and prevent them from exposing the elite’s lies. But with the help of Trump during his election campaign, the term “fake news” backfired and became the label for much of the mainstream media. It’s interesting to note that the mainstream media in the United States, for all practical purposes, ignored Bilderberg 2018 in Turin, Italy, as they have done every year. The propaganda put out by the Bilderberg conference is Orwellian in every sense. Through the mainstream media and other institutions that they control, the Bilderberg group are masters of Orwell’s “Doublethink,” accusing people of “thought crimes” by accusing them of consuming “fake news,” the use of non-politically correct words, hate speech, etc. The whole Bilderberg group discussion about the “Post-Truth” world is right out of Orwell’s 1984 and is an example of “Doublethink.” Doublethink means the power of holding two contradictory beliefs in one’s mind simultaneously and accepting both. Other mind-control terms from 1984 include, “War is peace. Freedom is slavery. Ignorance is strength.” Each one of these phrases represents complete contradictions, yet they are accepted as truth by the unconscious mind. If your mind was functioning as God created it then the idea of holding two completely contradictory beliefs in your mind at the same time you would totally reject as being irrational, but if you are the product of being scientifically dumbed down through media and the educational system beginning in pre-school, your brain would neurologically would not be able perceive this as absurd. Again, Orwell wrote his book 1984 in 1949, and yet he had access to knowledge about societies’ futuristic technologies and the modern science of mind control. For example, Orwell wrote about a “Big Government” that conducts mass surveillance on its citizens by watching and listening to them through their television sets. The clear majority of Americans today have little or no idea that mass surveillance is possible through their television sets, and if they do know about this, they think it just became a reality with the advent of HD digital flat screen television sets. One of the primary purposes of mass surveillance technology, which currently operates through the Internet, social media, television sets, cell phones, laptop and other computers, and numerous other electronic devices that people have no clue that they involve mass surveillance technologies, is to enforce the reality that you are constantly being monitored, so you better think and act exactly as you’ve been programmed to. Orwell wrote, “Orthodoxy means not thinking — not needing to think. Orthodoxy is unconsciousness.” This is what “Big Brother” used in 1984, where the “Thought Police” limit people’s thinking to specific “politically correct” mind-control words, and if you say anything that it outside of that tiny shoebox of consciousness, you are punished in many ways. Aldous Huxley, one of the primary intellectual leaders of controlling the masses through scientific mind control and the author of Brave New World, referred to the “scientific dictatorship” in which the globalist elite have the right to turn ordinary people and their children into slaves through scientific mind control and genetic breeding. When Huxley was giving a lecture to a convention of neuropsychiatrists at the University of California, Berkley in 1961, he openly said, “that in the truly effective scientific dictatorship, the people will not even know that they are slaves and they will learn to love their slavery or servitude” through scientific mind control and programming. This is what Huxley’s novel Brave New World was all about. Make no mistake, the globalists and Bilderberg are escalating their total war on truth through the science of persuasion and mind control designed to control the global narratives, which means censoring, destroying and removing alternative news programs and suppressing their content on social media. Today, the globalist elite are using technology, scientific mind control, and Artificial Intelligence to create an illusory paradise — or “Babylon” — built on a total war against truth. It’s no accident that Wells personally trained and hired Julian Huxley, who was the first head of the United Nations Educational, Scientific and Cultural Organization and developed a global educational program to indoctrinate the masses. Wells also trained Huxley who wrote Brave New World and developed the concept of the scientific dictatorship. The “scientific dictatorship” is built on the premise that you can program the masses via the media using scientific mind control and propaganda. It’s interesting that the front cover of The Beatles’ June 2, 1967 Sgt. Pepper Lonely Hearts Club Band album features what appears to be The Beatles heroes H.G. Wells, Aldous Huxley, Karl Marx, William Burroughs, Aleister Crowley and others. What’s interesting about these names is that many of these people were the leaders of the movement toward a world socialist government. Some of the people on the cover of the album were highly creative science fiction authors and high-ranking members of British intelligence. Others were involved in developing scientific mind control to control the masses like the “Great Satanist” Crowley who worked for British intelligence spying on Hitler during World War II and Karl Marx, coauthor of The Communist Manifesto. Whether they knew it or not, The Beatles were used as an instrument of mass mind control to promote globalism, socialism, the use of drugs like LSD and marijuana, Eastern mysticism, the occult, the sexual revolution and the new world order. The lyrics of Lennon’s song reflect precisely the goals of the globalist elite in bringing about their global government, economic system and religion. Also, the lyrics are heavily focused on destroying Christianity. But, ultimately “Imagine” is about propaganda built on lies to bring about a new world order. Since the time that “Imagine” was released in 1971, the world’s richest people, the globalist elite who represent about 1 percent of the world’s population, now own about 99 percent of the world’s wealth. In fact, at the time of Lennon’s death at the hands of an assassin, Lennon had a net worth of about $500 million. In today’s dollars that amount would be far higher. The globalist elite who promote social justice, the fair redistribution of wealth and the promise of a utopian society, or what Karl Marx called “a workers’ paradise” that would bring heaven to earth, are just using empty words to tranquilize the masses. The elite have absolutely no plans of sharing the wealth. They intend to rule and reign over planet earth like kings and queens while enslaving the masses through social engineering, indoctrination, propaganda and subtle forms of mind control. The term “fornicating” from Revelation 18:3 refers to the fact that the kings of the earth such as prime ministers, presidents and those with great power, along with the financial elite and heads of multinational corporations, or the “merchants” who became rich due to the power of Babylon, are prospering because of their spiritual union with Lucifer, who is the temporary god of this present world system known as “Mystery, Babylon — the Mother of Harlots.” We explored this in great depth in our bestselling globalism expose, The Babylon Code: Solving the Bible’s Greatest End-Times Mystery, the first book in The Babylon Code series. The second book in the series is Trumpocalypse. In the world system of “Mystery, Babylon,” the globalist elite make billions and trillions of dollars through secretive trade treaties and other means. Here, fornication means idolatry and the worship of a false god or gods by nations, individuals, a world state, or the new world order. It can also refer to the church or the pure Bride of Christ who has become unfaithful to her husband Christ by worshipping false gods. When discussing things like the globalist elite, Bilderberg and the Council on Foreign Relations, it would be a serious mistake to paint all members of these groups with an overly simplistic broad brush and Marvel cartoon-like character depictions as either good or evil. First, we are talking about a complex network of individuals and families who in many cases have different belief systems and values yet are members directly or indirectly tied to international banking families, the Bilderberg group, Council on Foreign Relations and other globalist groups. It’s true that some of the highest-level members of the globalist elite are those who would consider themselves ethical humanists and atheists To, whatever degree, there are those who practice the teachings of Crowley and the occult. But there are also those who are Christians, and I have met many humanists and atheists who hold higher ethical principles that many Christians I’ve known. I’ve been good childhood friends with some people who are at the highest levels of what could be called the globalist elite who were exceptionally good, moral and ethical when we were young, and as far as I’m aware, they still hold to those values. However, at the same time, within what is called the globalist elite, there are men and women who considers themselves amoral. They believe they are beyond any restraints in terms of traditional ideas of right and wrong. These same people would not hesitate to make a decision that could destroy the lives of countless millions of people through economic crisis, famine, war, or radical population reduction programs that could kill billions of people, all in the name of saving mankind and saving the earth. They hold to various belief systems such as the Malthusian belief that all of mankind’s problems are due to excessive population growth, which allows them to make decisions without feeling remorse or conflict. In fact, they believe they are empowered to do those things. Brzezinski is openly disclosing the belief systems and plans of some of the globalist elite like David Rockefeller, the Council on Foreign Relations, the Bilderberg group and Trilateral Commission. This doesn’t mean that everyone who belongs to these groups believes in this. Information in compartmentalized, and I would imagine that celebrity figureheads for the United Nations, a globalist elite organization, like Bono, Angelina Jolie, Brad Pitt and others don’t quite get it. Meanwhile, there are higher-level members of the Bilderberg group and other globalist institutions who are cultural celebrities known for their compassion, kindness, commitment to social justice, diversity, positive social activism, feeding the hungry and doing good works to alleviate suffering around the world, who are celebrated for their integrity and human kindness, and they are often heroes and heroines. Yet there is a dark veneer beneath this Illuminati mask depicted in Hollywood Director Stanley Kubrick’s movie Eyes Wide Shut starring Tom Cruise and Nicole Kidman. In the film, Cruise’s character shows up at a perverse Illuminati ball where occult rituals and sexual rites are performed in a scene that was shot at a Rothschild estate. The highest-level members of the occult globalist elite are aware of ‘The Plan,” and they are behind Brzezinski’s dictatorship through a technocratic elite and the “scientific dictatorship” called for by Aldous Huxley. Those words are not meant to be softened, nor are we to falsely assume that he is speaking metaphorically or in some humanistic compassionate sense. Brzezinski is taking about the “scientific dictatorship” discussed by Huxley in which the masses of ordinary people are dominated and subjugated by brute, violent and cruel force which forces them to be total slaves. But it’s worse than that. The slaves of ancient empires like Babylon and Egypt, along with the American elite who bought slaves from Africa, all had some limited amount of freedom and a very small amount of alleviation from their slave conditions, either by some tiny degree of human kindness or by default. When most people hear this kind of language, they subconsciously superimpose a humanitarian filter over it because they rationally cannot bring themselves to believe in the reality of the truly horrific reality that is being spoken of. Brzezinski and other members of the elite have an entirely different inner belief system and moral system. When Brzezinski says, “such a society would be dominated by an elite unrestrained by traditional values,” he means that the elite have transcended Judeo-Christian values such as an absolute moral right and wrong. The globalist elite operate from a purely humanist sense of consciousness, and in the worst sense of the word. They believe in a Darwinian and occultic viewpoint where, “only the fittest survive,” “might makes right” and genetically superior people have the full right to dominate, control, enslave, kill and do anything they want to both adults and children because they believe in a godless universe where man has not been created in the image of God, but rather is here by pure evolutionary and random chance. Russell was not joking. He believed in the use of weapons of mass destruction on human populations as a means of mass population reduction. Russell believed in a godless universe and the sheer brute force of Social Darwinism. “I believe that, owing to men’s folly, a world-government will only be established by force, and will therefore be at first cruel and despotic,” Russell wrote. This involved the use of scientific social engineering, persuasion, brainwashing and propaganda to shape the beliefs and ideas of the public through the media. In our book, Trumpocalypse, we feature our interview with Noam Chomsky, author of Manufacturing Consent: The Political Economy of the Mass Media, who argues that the mainstream media in the United States and around the world is totally controlled by powerful globalists and their multinational corporations that use social engineering, or scientific mind control, to “manufacture consent,” or a belief in fictional narratives that benefit the globalist elite at the expense of the working and middle class. The original term, “manufacturing popular democratic consent, was coined by journalist Walter Lippmann who worked closely with President Wilson and pioneered building a social science army within the United States that would use propaganda techniques and scientific mind control against American citizens. Lippmann was trained during World War I at the British psychological warfare and propaganda headquarters at the Wellington House near London. This was a secret team that included Sigmund Freud’s nephew, Edward Bernays, who went on to become the father of modern public relations and a master of propaganda. In his book, Public Opinion, Lippman wrote that it is through the mass media and modern mass communications such as movies and radio that most people develop the “pictures in their heads” of themselves, of others, of their needs and purposes, and their relationships. Lippman believed that most people have a desire to reduce complicated problems into easily solvable and overly simplistic formulas. Most people form their opinions not based on rational thinking, but by what they believe others around them believe, which is irrational and childish, but Lippman created his science of propaganda on this principle. For most people truth and objective facts are not an important part of their decision-making process. Lippmann also observed that the mere appearance of reports in the media bestow a kind of magical aura of reality upon those stories. Most people are convinced that if something weren’t true or factual that it wouldn’t be reported in the media. Conversely, the average individual believes that just because it’s reported in the media that it must be a fact. Lippmann also observed that people whose fame is built up by the media are “opinion leaders” with as much power to change public opinion as political figures. That’s why so many movie stars, television talk show hosts, and pop music stars have so much power to lead the public in any direction they choose. This was the function of John Lennon and countless other music stars, Hollywood celebrities and famous people. Interestingly, as far back as the 1920s, Lippmann wrote that mass public opinion is ultimately determined by the desires of the elite, the super-rich, and others who secretly control the world, and that their primary headquarters is in London. Notice how many of the thinkers and leaders in international finance, the musical celebrities, and the sciences of propaganda and social engineering all come from London. Lippmann commented that manufacturing public opinion by the elite requires organizers who are a “specialized class” that operate through “intelligence bureaus” and control the content and flow of information from the mainstream media, film, radio, print, television, etc. The all-out attack against Trump beginning during the election process and continuing to this very moment reveals a highly centralized and organized comprehensive strategy by all forms of media that are controlled by just a handful of globalist corporations to attempt to block him from achieving any of his goals and remove him from office. Never in the history of politics has any American president and his family been subjected to this level of ridicule, lies, propaganda, scientific mind control and persuasion at a completely unprecedented level and magnitude never seen before in America and in most of the world. The globalist elite and the Deep State that they control are waging a total psychological war against Trump to destroy him. The reason for this, is that Trump does not share the beliefs, ideology and goals of the globalist elite. The uniformity, narratives, talking points, personal attacks against Trump by numerous former presidents, celebrity journalists, television news commentators, television talk show hosts, movie stars, tech company giants, big-name politicians and the richest and most powerful people in the world, reveals that all of this is being deliberately coordinated at the highest levels by a global shadow government and an international Deep State. It’s not an accident that the Council on Foreign Relations, which is directly connected to Bilderberg group, openly presented a full-on Orwellian media presentation in which Richard Stengel, former Time managing editor and Under Secretary of State for Public Diplomacy and Public Affairs in the Obama Administration, at a university forum organized by the CFR, openly promoted the idea that governments need to direct propaganda at their own domestic populations. It’s not that the CFR and governments have not been directing propaganda toward their people since the founding of the CFR. It’s simply that a major leader from within the CFR has never so openly and boldly promoted a right to propaganda. 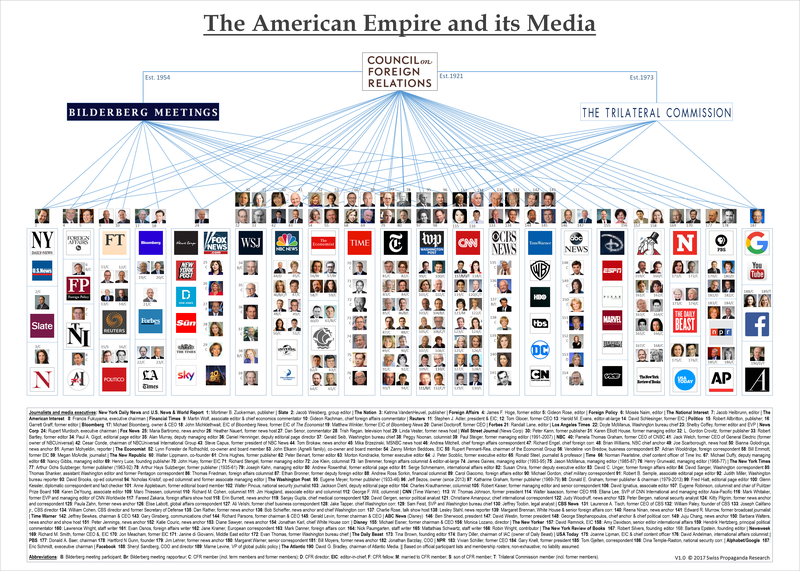 WikiLeaks and the Swiss Propaganda Research (SPR) center put together for the first time a detailed chart entitled, “The American Empire and Its Media,” with the words, “Bilderberg Group,” “Council on Foreign Relations” and “Trilateral Commission” below it. The chart shows the pictures of the faces of the people who run this media empire, the corporate logos, a detailed list of names and companies, and how they control the entire mainstream media through investments holdings. The chart will answer many of your questions about various media personalities and why they were put into positions of power in the first place. The Bilderberg Group, the Council on Foreign Relations and the Trilateral Commission are the primary nodes of power for the globalist elites and the shadow government. Pierce’s words are an academic way of saying that the Bilderberg Group, CFR and Trilateral Commission are employing a domestic form of psychological warfare against the American people. The past four presidents before Trump have all been members of the CFR as well as a sizable percentage of their cabinets. President George H. W. Bush was a director of the CFR, who was replaced by a member of the CFR, former President Bill Clinton, who was replaced by a family member of the CFR, former President George W. Bush, who was replaced by former President Barack Obama, who became the Bilderberg’s choice for president after flying to an annual Bilderberg meeting and who placed many CFR members in his cabinet. One would assume that although Trump was never a member of the CFR, the reason that he filled the White House with numerous CFR members was because, like it or not, the CFR and Bilderberg group essentially rule America and the world. Therefore, if you want to accomplish anything at all, you are going to have to, to whatever degree, work with the people who control the global system. ♠ One global identity for planet earth, on both the human level and one set of universal human values. This will create a “World Brain” based on the idea of the collective developed by communism. The individual will become the enemy and the very concept of individuality will be erased. However, just like there are special rules for special people in communist nations, individuals and their families among the globalist elite will be allowed to keep their individual identities. ♠ Centralized control of the world’s populations via “mind control.” In other words, controlling world public opinion through media, social media and the Internet. ♠ A new world order with no middle class, only “rulers and servants (serfs),” or slaves and rulers, and, of course, no democracy. ♠ “A zero-growth society” without prosperity or progress for the common person, only greater wealth and power for the rulers. ♠ Total control of education to program the public mind and train those chosen for various roles. Parents and students will not be allowed to choose their own careers. A person’s lifelong career will be selected by the government through a series of computerized evaluations and psychological tests. ♠ A centralized global government with control of all foreign and domestic policies. Under this global system, there will be two kind of world states, a spectacular one for the globalist elite and a world state where people will not know they’re slaves. The key to making all this happen is education and indoctrination. Beginning in 1917 when John Dewey, the father of public education, returned from the communist revolution in Russia, the elite began their plan of absolute control of education to program the public mind and train those chosen for various roles. Aldous Huxley’s brother, Julian Huxley, was the first head of UNESCO, which was the global educational division of the United Nations designed to a create a single global curriculum to indoctrinate students. Its primary educational program is called Common Core. Meanwhile, the elite use trade treaties like the TPP, NAFTA and WTO to do an end run around the U.S. Constitution and transfer wealth, jobs and manufacturing to countries outside the United States. Notice that starting at the exact same time that these trade treaties were implemented, the American people began to lose good-paying jobs as decent jobs were outsourced to Third World nations and manufacturing plants were moved to Third World nations. The purpose of this was to lower the standard of living of the American middle class and raise the standard of those living in Third World nations. Again, the reason for the uniformity of the unending attacks on Trump is that Trump represents a vision of America and the world the elite despise. The elite want to rule the world and the massive rise of populism in America, throughout Europe and other regions, is primarily due to Trump. The elite don’t want populism because populism expresses the will of the people and not the will of the elite. In America, our Constitution begins with, “We the People,” which is something the elite want to destroy. In addition to trade treaties and outsourcing, the replacement of human jobs by robots, cyborgs and androids with Artificial Intelligence is set to explode. The elite know that there will be revolts of large numbers of people around the world if they lose their jobs to robots. As such, certain governments around the world are already publicly discussing guaranteeing their people a comfortable annual salary, if they should lose their jobs. But just how long do you think that governments and the elite are going to pay comfortable annual salaries to people that are not working? They will do it for as long as it takes to make a transition, but once that happens those annual salaries will end. When George Orwell, Aldous Huxley and others in the elite told us that Big Brother governments would arise, they didn’t calculate into their equations things like Artificial Intelligence, transhumanism, microchip implants, computer-to-brain interfaces, the internet and social media. Soon it will be possible to for Artificial Intelligence to upload the consciousness of one person, including a synthetic artificially intelligent consciousness, or take over an existing human consciousness in a human body, and totally control it. In terms of rulers and slaves, this will allow the rulers to use Artificial Intelligence to dominate the minds of once ordinary people, eliminate their individual consciousness, and create a “World Brain” for a slave population.